One of Bex’s favorite activities to do is plan out a whole menu/dinner date for friends. This past weekend, I finally met one of my best friends, Emilee Petti! Yes, you heard that right, folks. I met one of my best friends for the first time. Emilee and I share the same best friend of the one and only, Katie Prue. Katie and I became friends through St. Lawrence University where as Emilee and Katie became friends growing up together in Lockport, NY. The weird, crazy antics that the three of us embody 24/7 have allowed us to form a genuinely great friendship even through our geographical distance from one another. Although my previous communication with Emilee was merely through texting, Snapchat and phone calls; it was awesome to finally meet a girl who I have considered a supportive and valuable friend for over a year now. Details of the delightful dessert that I made for the “long-lost best friend” are coming up in a future post, so stay tuned. But, back to my love for prepping a lovely evening and experimenting with new dessert delights! The greatest part that drives me to enjoy hosting people for a meal is my love for remembering the tiny details that people do not even recall saying during conversation. Despite my terrible memory, I seem to remember when someone quickly mentions his obsession with chicken, love for Crisp Apple Sparkling Ice or passion for anything lemon-flavored. I guess you could contribute this to the odd-mindset of a food blogger myself. With that said, I prepared a pretty grand dinner and dessert (if I do say so myself) for my fellow coffee-lover, Ismael, whom I had the privilege of meeting at the Batter Bowl Bakery a few weeks ago. When Ismael and I were at a beautiful Austrian cafe called Kafe Leopold in Georgetown this past week, I took note of his minute mentions of certain tastes and foods that he was fond of. With lemon and fruit among his favorite things, I decided to experiment with a rich lemon pudding cake with fresh blackberries, pear slices and kiwi on top. ‘Twas mouthwatering to say the least. So, I’ll leave you with a special little Saturday motivation: When life gives you lemons….make Bex’s Lemon Pudding Paradise. Hehe. Have a great weekend, friends! Meanwhile in a small bowl, whisk egg whites for a few minutes. Fold into the pudding mixture and pour entire mixture into ramekin and sprinkle top with cinnamon. Place ramekin in the middle of a roasting pan and fill pan with enough water to cover halfway up the sides of the ramekin dish. Bake for 40 minutes. Remove from oven and let cool for 20-25 minutes. 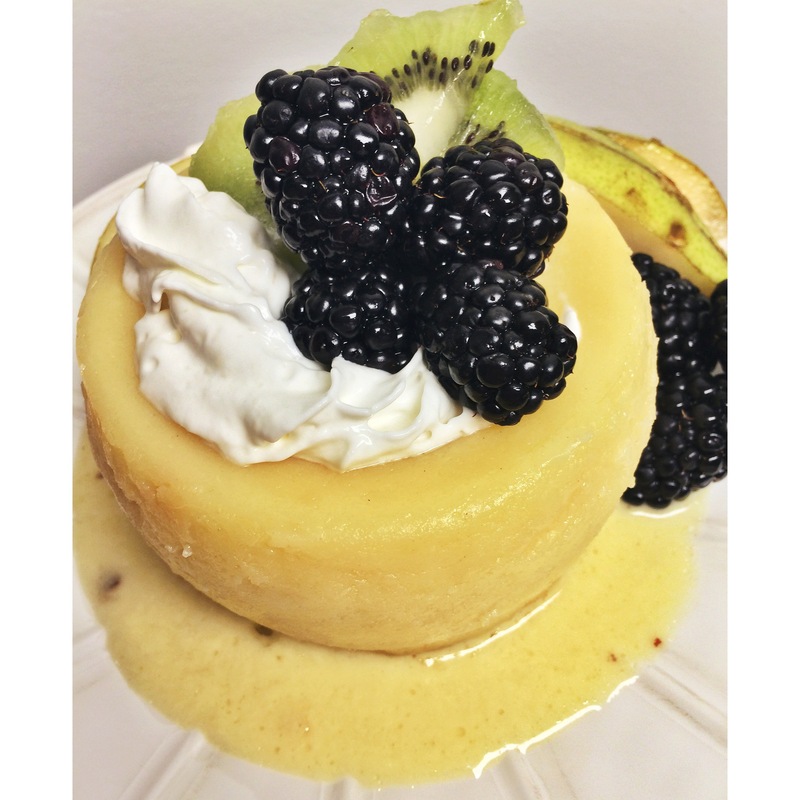 Serve warm or cold with a dollop of whipped cream and fresh fruit; the perfect spring dessert! Bon appétit!